This ornate church in Moscow was filled with chandeliers, stained glass windows, candles, and ornate carvings. 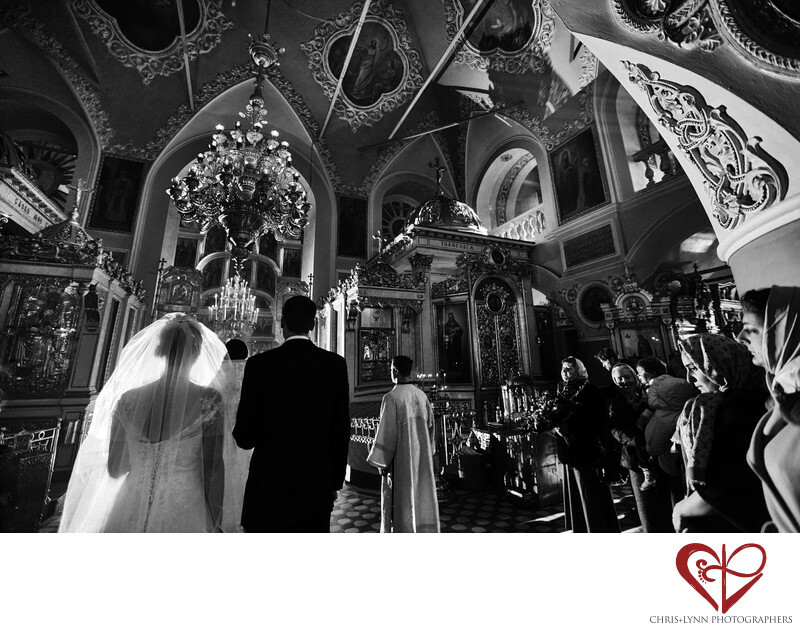 The couple had a Russian Orthodox ceremony that included many traditional customs. For example, instead of the Western exchange of rings indicating the confirmation of the marriage, this moment is commemorated with the placing of golden crowns on the heads of the bride and groom. Wearing these crowns, the bride and groom then walk three times around the Bible as a symbol of the pilgrimage of the journey the couple will make together as a married couple. At one time, these crowns were worn for a period of 8 days but they are now removed at the end of the ceremony. Right before the crowning takes place, the couple have a betrothal ceremony in which the priest gives the bride and groom each a lighted candle and then blesses them. This image is taken at the beginning of the betrothal with the 16-35 mm to encompass the entire scene including the parishioners who were in the church at the time of the ceremony. I love the solemnity of this image and the dramatic lighting of the bride’s veil at this important moment. 1/500; f/2.8; ISO 1600; 16.0 mm.